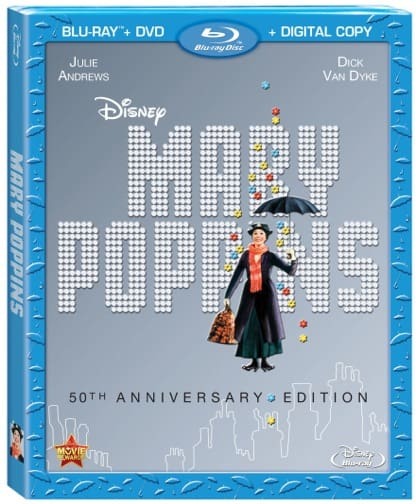 It’s a jolly holiday this Christmas season with the delightful arrival of Disney’s beloved Mary Poppins, lovingly restored for its 50th anniversary and debut on Disney Bluray/DVD and combo pack. If you haven’t brought home your copy of this classic musical, it’s been available since December 10th, 2013. Don’t miss your chance to own a film with unforgettable characters, catchy tunes, and a great message about the importance of family. As I child, I owned a copy of Mary Poppins on VHS. I have very vague memories of watching it on several occasions. I don’t remember my exact feelings about it, but if I had to guess, I would say I enjoyed the songs and the banter between Bert and Mary the most. It’s also pretty likely I didn’t understand what the message of the movie really was. Now as an adult, I am glad I watched the movie again so I could appreciate it on deeper levels. It’s more than just a film paired with animation—it has a strong message about family that is perhaps even more relative for today’s on-the-go parents. Jane and Michael Banks, the young children of a very busy banker, have run off their nanny. Mrs. Banks has her hands full with her women’s rights causes and has little time for her children as well, so a new nanny must immediately be found. Jane and Michael have their own ideas for what they want in a nanny, but when they approach their father with what they’d like the newspaper advertisement to say, he ignores their adorable song and rips up the paper, throwing the pieces into the chimney. Magically, the torn of pieces of paper travel up through the chimney and ascend into the night air, where they are pieced back together by a mysterious woman sitting in the clouds who fits the exact profile of what Jane and Michael want in a nanny. The next morning, Mary Poppins literally blows away all of her nanny competition, and becomes the new Banks family nanny. The children become quite attached to Mary Poppins, who is “practically perfect”, and takes them on adventures in the park inside of chalk drawings, has a tea party with them on the ceiling with Mary Poppins’ Uncle Albert, and thrills them when her bottle of medicine tastes like delicious treats instead. Meanwhile, Mr. Banks lands in some trouble at the bank, jeopardizing the family’s livelihood. But soon after, everything that Mary Poppins has been trying to convey to the Banks adults clicks into place and he realizes he is the richest man in all of London because of his beautiful wife and children. Mary Poppins is a movie that speaks to all audiences. Children watching will want nothing more than a day with Mary Poppins and her mysterious magic, and adults may see pieces of themselves in the stretched-too-thin Mr. and Mrs. Banks. 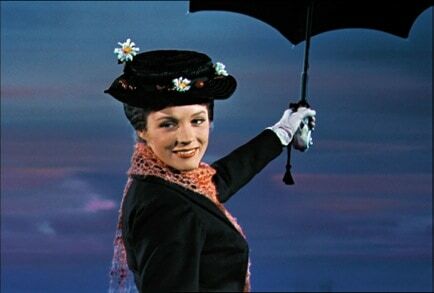 But don’t try to analyze this movie or Mary Poppins too much, because she never explains herself. Just enjoy the magic, the cleverly written tunes, and Mary Poppins, who is unlike any other. Mary Poppins: From Page to Stage A fascinating feature containing interviews with Richard Sherman and Jason Schwartzman, the latter who will be portraying the former in the upcoming Disney release Saving Mr. Banks. Learn a bit of the back story behind how Mary Poppins was developed into a musical, and why P.L. Travers did not want Americans to be in charge of bringing it to the stage. Disney and Broadway An intimate discussion between the original Broadway stars who portrayed Mary Poppins and Bert, how they won their roles, and what Mary Poppins has come to mean to them. Step in Time The most impressive number from the Mary Poppins musical, as performed by the Broadway cast. I’ve had the pleasure of seeing this performed live twice, and it’s fantastic just knowing how much hard work went into practicing the scene. Mary-Oke Sing along to the songs from the musical as the words travel across your television screen. this was on ABC Family last night! such a good movie! I haven’t seen this movie (and I’ve been around longer than it has). I haven’t watched this movie in so long. I love the spoonful of sugar song! Thank you for sharing. 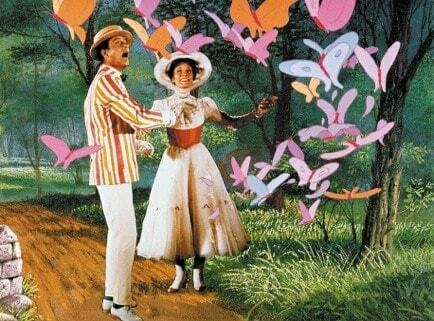 Mary Poppins has always been one of my favorites! Will have to pick up a copy of it! i absolutely love this movie!! havent seen it in years and cannot wait to watch it again! One of my favourites! What a classic. I’ve really been enjoying watching the older movies/cartoons lately, I have an entire different perspective now that I am an adult. Grew up on Mary Poppins! 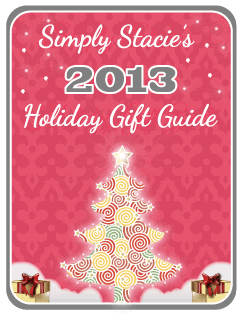 I know quite a few people who would love to get this for Christmas! I had the LP (Long Playing vinil record for you youngsters) and played it so much I wore it out. I know someone who would love this. I remember watching Mary Poppins as a child. This is one of those films that you don’t mind watching over and over and it has such wonderful songs that you find yourself humming or singing them days, weeks, or even months after watching the film. I think the 50th Anniversary Blu Ray + DVD set would be a wise investment. Thank you for this review.